After gone thru all your bento blog, you should open a bento class & i'm pretty sure you can get plenty of student. Sometime I wonder how you do it. Really enjoy your blog. My children say Aunty have a wonder mind! Tks for sharing! Now you're a baker? Donuts and bao? I'm so impressed Lia!! I will look for your recipes because these look so fluffy and cute! Hi Lia, welcome back :) I'm sure you can be a great baker too with your good photography skills. @sheri fujihara chen : I'm starting to enjoy baking. Donuts were from store but I'm looking forward to bake my own. Still looking for the baked donut recipe, if you know any please DM me. Meanwhile, I will post bao recipe soon. Thanks Sheri! Really hope I hav chance to learn from you one day (in person)...really love reading ur blog. Welcome back Lia! 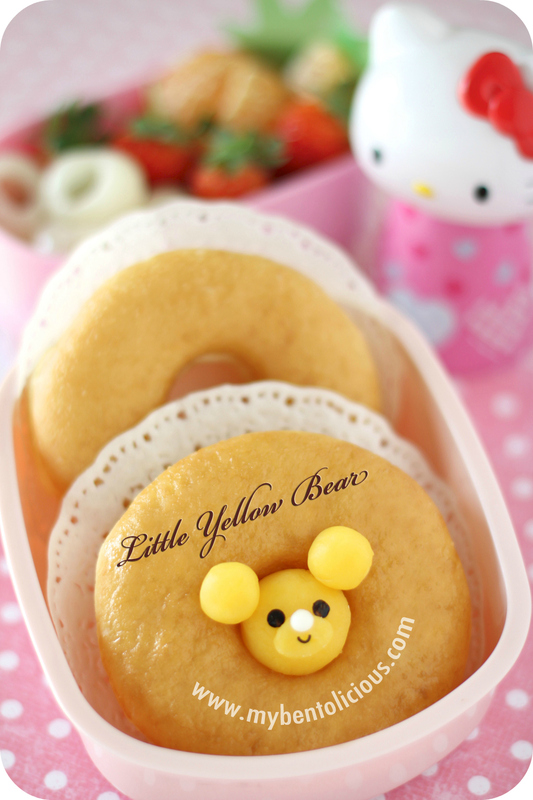 Your yellow bear is just too cute. I love that you took baking class, maybe that's what I should do. :D I have not yet tried to make boa yet, but it's on my list. (I'm still nervous about that). I can just imagine all the beautiful goodies that you'll be baking up soon! Those doughnuts look so yummy and the mouse is too cute! :) I look forward to catching up on all of your posts Lia! Your bento never failed to surprise me... just love to click on "Bentolicious" everyday i saw your new post..hehe..
@Bobo : Thanks a lot for your kind comment! I also love to see what other bento bloggers make everyday :) Hope I can manage my time and learn baking more. Cute! Bento is not just for lunch! simple doughnut turns to be adorable one, you're so talented. I am also looking forward to your baking experiment! Loves your Bento and how you photograph them. The neat yet interesting layout and nice colour coordinations. Well done! Such an inspiration.